Ian Rutter should have known his life would be changed by fly fishing when he started scheduling his college classes around the release schedules on the East Tennesse Clinch River. His first job in fly fishing was at Little River Outfitters in Townsend, Tennessee. He guided and worked in the shop by day and worked the front desk at a local hotel by night. Ian still lives in Townsend, TN in the shadow of Great Smoky Mountains National Park with his wife Charity and their daughter Willow. The Great Smoky Mountains, Catalouchee Creek, Hazel Creek, Abrams Creek and down to the tailwaters of the Nantahalla River Ian Rutter has fished it all. Listen to Ian share his secrets and life long love for this beautiful fly fising haven. He is a partner in R&R Fly Fishing Smoky Mountain Guide Service and spends almost every day on the water either wading the streams of the Smokies, drifting one of East Tennessee's great tailwaters or cold water lakes, or floating one of several smallmouth bass rivers. In addition to a busy guide schedule, Ian hosts trips to fly fishing destinations outside of the Southeast. In 2001 Ian decided to seriously pursue outdoor writing and photography. Ian has written several books that highlight fly fishing in the Southeast. His books include Great Smoky Mountains National Park Anglers Companion, Tennessee Trout Waters Blue Ribbon Guide, and his newest release Rise Rings & Rhododendron - Fly Fishing the Streams and Tailwaters of Southern Appalachia. Ian also hosted the Fly Fishing Eastern Freestone Streams DVD series. His photography appears in all of his books and his articles and photographs have appeared in a number of national magazines. 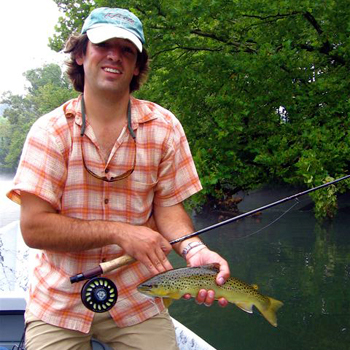 Ian serves on the board of the Little River Chapter of Trout Unlimited in East Tennessee. He works regularly with fisheries biologists in the Great Smoky Mountains National Park on native brook trout restoration projects as well as annual trout population surveys of his home waters. He is a regular contributor to national magazines. Ian guides anglers on the wild trout streams of Great Smoky Mountains National Park. He also guides anglers from a drift boat on the Clinch, Holston & Tuckaseegee Rivers. For more information on Ian guide service, books, articles and videos visit his website at www.randrflyfishing.com.